What’s Beijing known for? Well, for starters, Peking Duck, Tienanmen Square, the Forbidden City, the Great Wall of China, amongst many other things. It’s also known for its smog – the city underwent serious smog-reducing activities in preparation for the 2008 Beijing Olympics, but they have a lot more work to do. 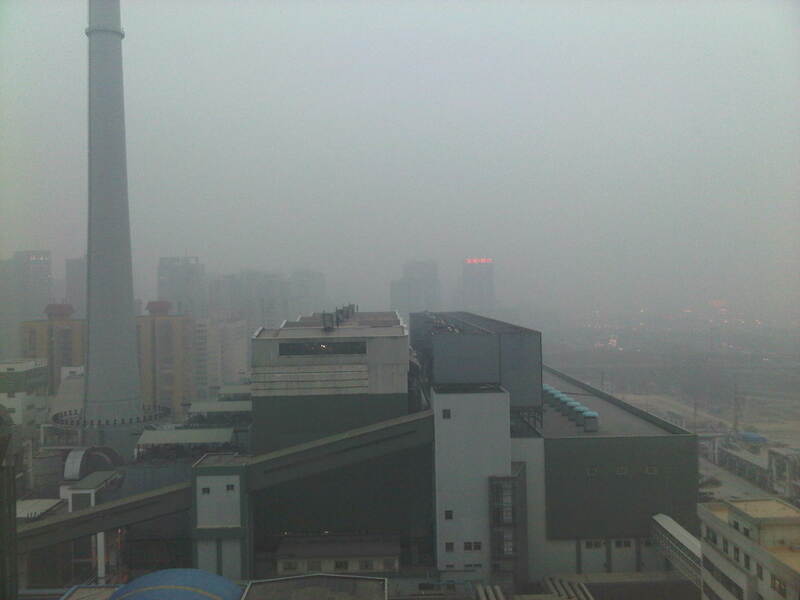 During the last few days, Beijing has experienced the worst amount of smog ever. The PM2.5 measure (read up on it here: http://en.wikipedia.org/wiki/Particulate) is literally off the charts. It’s all over the news! And of course, I picked this particular time of year to visit 🙂 Having lived in Stockholm for almost 5 and a half years, I’ve gotten used to living in an environment with some of the cleanest air in the world, so this was a big shock for me. The air smells of burnt plastic all the time. After walking around for a few hours, you get home and your face is covered with a nasty grime and your hair smells like a fireplace. Not to mention all of the junk that’s already made it into your lungs. Ugh, I am so glad to be leaving tomorrow. My Mandarin is so bad that I can’t communicate effectively with the Beijing population. I can speak decently enough to ask for directions, when to get off the bus, where to find Tienanmen Square, etc, but I can barely understand their answers. Part of this is because their vocabulary is far more advanced than mine, but the other part is probably due to their use of phrases and terms that I never learned or used at home. I am illiterate in Chinese. Even though I took 2 hours of Chinese school every school week 12 years (about 1000 hours of Chinese! ), I don’t have much to show for it. I can only read a few Chinese characters, which makes it difficult for me to find my way around. I feel more helpless in China than the average Western person. It’s simple – I look Chinese, so everyone in Beijing expects me to speak it. Fair enough – it’s my fault that I don’t communicate it well enough. If you look Western, no one is going to assume that you speak Chinese, and no one is going to look at you with a condescending eye if you ask a stupid question in English. I don’t “fit in” with the Chinese people. I grew up in the United States and have lived in Stockholm for the past 5 years. The cultural differences between East and West are quite great and in many cases, the behaviors are off-putting. For those of you who have been to China, you know exactly what I mean. I can’t help but give a dirty look to the guy who clears his throat and spits on the subway floor, and I can’t help but look disgusted at the woman who litters and callously throws her dirty napkin on the street. There is a huge difference between the mainland Chinese and those that live in Taiwan. My family is from Taiwan, so I consider myself Taiwanese. The Taiwanese, being used to democracy and freedom of speech, are more familiar with US and Western norms. The Taiwanese can freely criticize their government without being thrown in jail. Mainlanders are taught to literally “love their country” without challenging anything that the government does. Those that do are censored, thrown in jail, or worse, made to disappear. I got lost on the way to the Badaling Great Wall today. I got to the bus station easily enough – I managed to ask a traffic officer where the buses were, so he pointed me in the right direction. 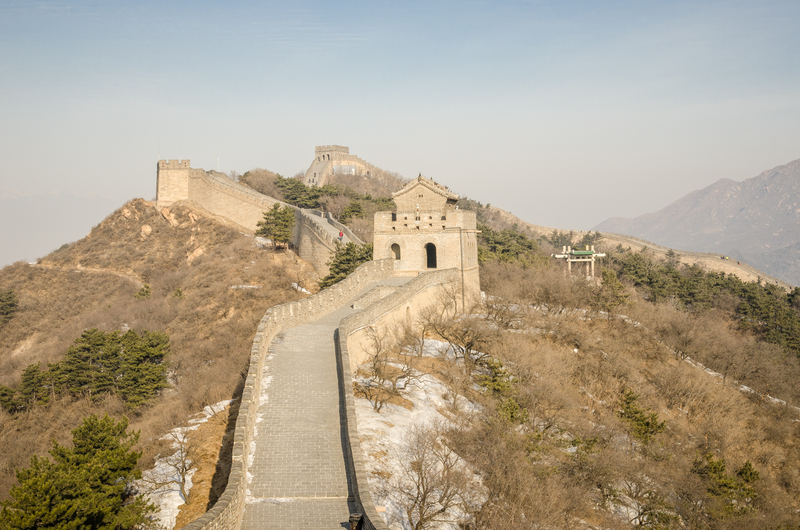 I saw bus line 877 — that’s the one that I wanted since it was a direct shot to the Badaling section of the Great Wall. I asked the driver when she was planning on leaving, but she told me that they won’t be going anytime soon – bus line 919 is much busier and that I should take that one. So I hopped on the first 919 I saw. Luckily, there was a group of 9 college students who wanted to go to the Badaling Ski Resort, so they got off in the middle of the freeway. I jumped off the bus with them. The first thing I did was ask them if they spoke English since I was not too comfortable with my Chinese. A private taxi driver waiting by the stop offered harrassed me and wanted me to take me to the Great Wall on his motorcycle for 50 RMB (no thanks!). I asked the students if it would be okay if I hung out with them on the way to the ski resort. They were very friendly and tried to help. Long story short, I crossed the freeway and caught a 919 bus going the other direction and was dropped off at Badaling. The conductor at the back of the bus (responsible for collecting fares and calling out stops) was very kind and told me exactly where I should get off. 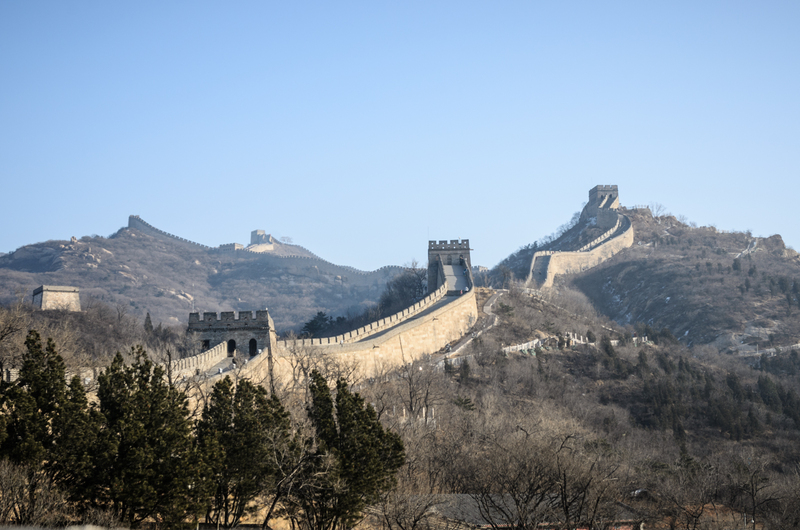 I climbed the Southern and Northern parts of the Badaling wall, took some photos, and went back down to the bus stop. A 919 bus went by – it wasn’t headed for Beijing. Another taxi driver came by and kept offering to take me to Beijing… again, no thanks. I walked around the area for a bit and another 919 came by. I had walked too far away to ask if it went into Beijing, but a man who was also waiting told me that the 919 that just went by was the right one. Doh! He also explained how you could tell whether the bus was going to Beijing. A complete stranger, but a helpful one! He was waiting for the 880 bus, which also went into Beijing, so when that bus came, he motioned at me and I got on the bus. And sure enough, it took me straight into Beijing after a few stops, including one where the bus driver got off at a gas station to relieve his bladder! It turned out to be a good trip – memorable for sure – but it was also a little sad when I confirmed how little of a connection I have with real Chinese people. I feel more connected to Sweden and its culture than I do to Chinese culture. I am fluent in Swedish and can read and write the language decently. I like to keep the environment in mind and take a nummerlapp when I stand in line. I think Swedish fashion is great, and I was severely craving sunshine after a dark and gloomy autumn. What’s it like for those of you who are born and raised in a different country than the country of your ethnic background? How’s it like when you visit your homeland? I’m an American-Chinese living in Malmö and had pretty much the same experience in China as well. Millions of hours of Chinese School on Saturdays (in Cantonese) has given me the ability to speak on the same level of a 6 year old! So I totally understand! Whew! Now I don’t feel so bad having wasted a lot of my parents’ money 🙂 Do you have a chance to practice your Cantonese in Malmö? You have to be kind to yourself (if all those hours of Chinese lessons produced no good result)… but take some Chinese lessons as an adult too if you have time (Adult lessons are more effective I think). I don’t think it’s simply the language that can make one feel Chinese. If you had been fluent would you feel like a Chinese in Beijing? In my case, back in the 80’s my siblings and I met with our Grandma, aunts & uncles and cousins in my father’s hometown (a very small town and the nearest well-known city is Xiamen). Of course along the road we felt more Filipino (we were born and raised in the Philippines) and felt like one of the other travelers from the Philippines. But after staying a few days in my Grandma’s big house and talking to so many cousins (we were fortunate the Chinese Hokkien dialect that we speak at home in the Philippines is almost the same (except for a few words and accents) as the dialect that my cousins use at home) I felt Chinese. Then many years later, after college, when I met people who claimed to be “pure Chinese” (their word, not mine) but who never use the language and act with less than polite manners, in my mind I curse them for wanting to spoil the Chinese image here in the Philippines! I don’t know where I got the idea but for me, a Chinese is one who is frugal, hardworking (more hardworking than most people here in the Philippines), clean-living, mindful of the surroundings and helpful. It could be because I grew up with people like that? At any rate, I salute you for having the opportunity to live/stay in the US and Sweden (and speak the Swedish language). I thought this post would be about what it’s like being Chinese American in Sweden. Any thoughts for a southern california Chi-am?